Zinc is of vital importance for the growth and seed production of grain crops. A deficiency of zinc usually develops during times of cool and wet conditions, when seeds from zinc-deficient plants are planted in sandy soils. Deficient symptoms are produced because of poor availability of zinc, rather than presence of low quality of zinc in the soil. The low availability of zinc in soils of high pH results from the absorption of zinc to clay or lime particles. in addition, zinc uptake and its translocation to the shoots is inhibited by high concentrations of bicarbonate, which occur as a result of residue decomposition and the production of carbon dioxide in the soil. A zinc deficiency in crops, rather than a “nitrogen negative period” is in fact created by cultivation methods such as minimum- or no-tilage. In high rainfall areas, zinc and calcium deficiencies should be considered as the most common cause of poor growth in cultivated crops. Lime is commonly applied to ameliorated aluminum toxicity in acid soils. However, small amounts of zinc and boron should also be applied on a regular basis to advance uptake of calcium. Unfortunately, the risk of zinc deficiency will increase when lime is applied to acid soils. Although the application of lime overcomes aluminum toxicity, it requires an additional supply of zinc to prevent symptoms of sever zinc deficiency in crops. Certain herbicides may also induce a zinc deficiency in crops. Zinc-deficient plants are therefore more sensitive to herbicide damage than zinc-efficient plants. Zinc-containing fertilisers are not very effective against a zinc deficiency in plants. Granular fertilisers usually contain zinc oxide, which is not soluble in water and therefore, not effective against the early symptoms of zinc deficiency in plants. However, application of zinc oxide to the soil will supplement the zinc content of soils. Indigenous zinc in the soil is taken up by plants during the release of hydrogen from ammonium nitrogen. Therefore, the effectiveness of zinc oxide depends to a large extent on the use of nitrogen in the ammonium form. Zinc sulphate is effective on the field crops when large amounts are broadcast. However, when blended into fertilisers it reacts with phosphate to form compounds which are not water soluble. Superphosphate is an old fashioned source of phosphorous, but it also contains nutrients such as calcium and sulphur, as well as small amounts of plant-available zinc. Stunted growth, yellowing and drastic decrease in leaf size are symptoms of sever zinc deficiency in maize. Maize seedlings often show symptoms of both zinc and phosphorous deficiencies. Such symptoms are most pronounced on acid soils fertilised with blends of urea and the alkaline form of ammonium phosphate, also known as DAP. With the onset of warm weather, plants usually become dark green in colour. However, zinc-deficient plants never grow as tall as zinc-efficient plants and they are less tolerable to heat stress. Zinc-deficient plants are also more susceptible to stem and cob rot. At the end, yields are depressed and grain of low hectolitre mass is produced. In zinc-deficient cereals, grains quality is depressed due to impairment of photo-synthesis and a failure of zinc-dependant enzymes to protect chloroplasts from the harmful effects of sunlight. At first, lesions similar to those of fungal diseases are produced, but within a short period of time, leaves are dying prematurely. This phenomenon, known as photo-oxidation, is common during times of intensive sunshine after good rainfall. Soon after the leaves and died, ears will also turn white in zinc-deficient plants. Grain yields could still be average, but quality of grain is negatively effected. Legumes such as soya and dry beans are often more seriously affected by zinc deficiency than crops from the grass family. Leaves with distinct yellowing between the veins are produced in the zinc-deficient plants. Such symptoms usually occur in dry beans which have been fertilised with not too much nitrogen. With high applications of urea or nitrate nitrogen, plant growth is even more restricted, although leave are not yellow anymore. Moreover, necrotic lesions usually occur on middle-aged leaves of zinc-deficient plants. Such lesions should be attributed to poor calcium uptake by zinc-dificient plants on acid soils. A liquid applicator, mounted on the planter, can be used to apply Zinc-flo to the soil next to the seeds of maize, sorghum, sunflower, soya and dry beans. With this method, sufficient quantities of water-soluble zinc are made available to the roots of germinating seeds. For wheat and barley, a full cover spray is recommended before or just after emergence. Apart from its activity against zinc deficiency, Zinc-flo also has the capacity to control mildew and yellow rust in wheat and barley. Fungicides are commonly used in spray programmes on wheat and barley. However, most of the time, flag leaves are dying prematurely due to zinc deficiency rather than the presence of fungal pathogens. Photo-oxidation of flag leaves did not occur in zinc-sufficient wheat cultivars. A tank mix of systematic fungicides and Zinc-flo is required for effective control of both fungal and physiological diseases in wheat and barley. A combination of Zinc-flo and Demildex should be used as a foliar spray on dry beans to prevent micronutrient deficiencies, as well as fungal diseases such as mildew and anthracnose, (Fig. 1) gives an indication of how healthy dry beans should be when plants are regularly sprayed with a combination of Zinc-flo and Demildex. Both products are being manufactured by Delta Chemicals (Pty) Ltd in Meyerton, from where it can be obtained directly or, through local dealers in agro-chemicals. Fig 1. 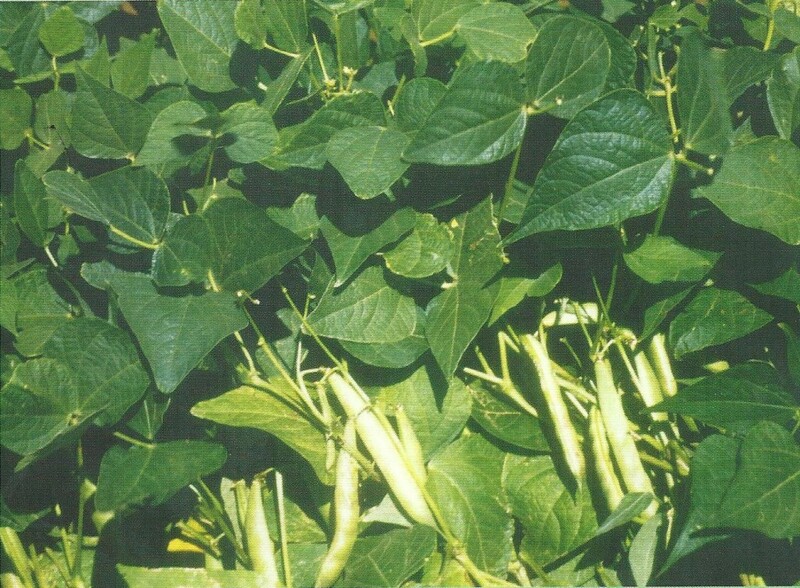 Dry beans can be very healthy when plants are sprayed regularly with a combination of Zinc-flo and Demildex.